IN CONTROL 3.5 – anything like it online? The closest thing I’ve seen to IN CONTROL is OmniOutliner. A lot of the “look” of OmniOutliner is very much like IN CONTROL, though I don’t feel it’s the same intuitive experience – or more likely, I’m simply not as familiar with OmniOutliner and so I prefer sticking with what I know. Like IN CONTROL, OmniOutliner is still a desktop based program. Given my preference to Web based applications (Yahoo! Mail, Google Docs etc.) I find having something like OmniOutliner tied down to my home machine very limiting. What I’d really like to have is access to something like an online IN CONTROL program. Anybody know of anything? In Control has never been owned by FileMaker, Inc. or by Claris. For 15 years, I have been maintaining a three mac network expressly for running InControl for Workgroups 3.5. I buy older refurbished macs and run System 8. I found that the sharing function did not work properly on later systems. It is the best tool for group scheduling and job tracking that I am aware of. We have a customized outline that allows us to track all of the components of our business (custom door manufacturing). I always feel that I am living on borrowed time with this configuation and would be first in line to buy an OSX version. Please keep me informed by email at diamelle@texas.net. I used InControl for years and loved it. After being forced to switch to the Windows platform for work reasons about 8 years ago, I’ve always looked for a substitute to InControl from Attain but absolutely nothing comes close to the functionalities offered by this program. I miss it so much! Once in a while I make a search on Google in hope that a company somewhere brings InControl back, and makes a PC version. When I saw your post here today, I was very excited. Is there still a chance that InControl will be resurrected? I would be the first one to pay or pre-pay to reserve my copy! Please let us know how things are coming. We’re in the final stages of signing off with a software vendor for the port/re-write (more of a re-write than a port at this stage). We’re told the re-write will take approximately 24 weeks (once we sign off and pay). Keep checking back, I will be providing more frequent updates once the re-write starts. Here’s another fan of IN CONTROL from the good old days hoping to see its resurrection for OS X. Hope it all works out! I cannot wait for the new version! I have used In Control for over 10 years and I love it! I managed the work of 125 engineers in the “old days” using a Mac SE and InControl. I have never been as productive without it. Unfortunately, everywhere I work these days is a Windows shop. Anybody know of anything similar for that platform? And, any chance of porting the results of this new initiative to Windows? An iPhone app too! There's Zeptoliner (which I use and like OK), but would love to see what IN CONTROL for the iPhone would be like. Has the re-write of InControl started yet? Please keep us updated. Will the InControl re-write include built-in import & export features? The original program used the Claris XTND system which had to be installed separately. Is there anyone out there who is ready to see what can be done to save this application. It's the best management tool that was ever developed. There is money to be made here. Let's put some effort and some money behind it and it could make it big. Anyone knows the business? Hello there! As a regular user of OmniOutliner, I stumbled upon this blog post during a routine browse around the web. For those people who wish that they could run "In Control" on a modern PC or Mac, why not use a free emulator like "Basilisk II"? My Mac's OS is Snow Leopard — but in a Basilisk window, I can type an outline into MORE 3.1 running on System 7.5.3. Basilisk can be a little tricky to coax into life, but there are step-by-step tutorials on the web. It's available for Mac and PC and you can even make one of the host operating system's folders appear on the virtual Mac's desktop as a HDD, and thereby share files between System 7 & Windows/OS X/Linux. Our head custodian purchased In Control in ’92 and has been using it ever since. He can’t stop talking about how great it is. I need to upgrade his Mac, but, he does NOT want to lose his “IN Control”. Some of the above posts mentioned a possible osx re-write. Is that really going to happen? Sorry John, as far as I know, OS9 is it. My all time favorite app…I miss it tremendously and would buy it in a heartbeat! to continue using Classic and if i am honest with myself largely to keep using In Control. There is really nothing currently equivalent.. its a work flow wonder for anything really. I hope they were successful in their subsequent careers. I would pay hundreds for a OSX system I can tell you!! 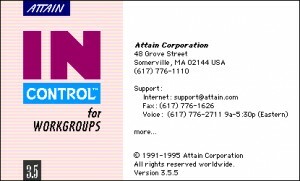 InControl was my favorite Mac program, as it was of many a top execs at Apple. What is so hard about creating a copy of it? It was just a spreadsheet with collapsable hierarchies and customizable and sortable columns. Sounds like a money making opportunity. Agree, totally. Lets have it back! It was fast, simple, great note taking and scheduler. Heck to the yes! In Control was totally the BEST program ever for organizing tasks & timelines. I miss it soo much! I wish I still had my old Quadra so I could run it!!! Any updates?!??! Also, anyone have any idea where I can get ahold of a copy? InControl is an incredibly useful program. It seems strange that a program so good, that someone hasn’t jumped at the chance to upgrade it. It would be an automatic money maker. Wish I had the skills to do it. I am using InControl on a Powerbook with MacOs 9.2 and it’s working pretty well. I’m also using OmniOutliner, Inspiration 9.0 and More 3.1. When I’m tired using MSProject , I switch to InControl and its easyness of use is a wonder. I also am continuing to use In Control I have a 4.0 version. I run it on aPowerbook G4 that a friend set me up with It runs both Mac OS X and OS 9 so I can use In Control. I have looked for years and have not found anything that meets my needs like In Control. If I had the skills I would rewrite it. What happened to the people who were going to rewrite it in 2009? Just found out that Circus Ponies Notebook has folded. This was my In Control substitute for the last few years and as an outliner was the next best thing. Notebook 3.1.2 stopped working reliably with OSX El Capitan and I just missed upgrading to 4.0, so that’s that. However, in searching for a replacement I found Tree 2 for $11.99 in the App Store. It’s not bad, though the checkboxes are an optional view and there’s no date stamp for completed tasks. I’ve written the makers in Japan and they said they’d consider these for future releases. I am developing an app which has similarities to In Control, Lotus Agenda, GrandView, Ecco. We expect to launch in April 2018. The product is still in Alpha but making great progress. Development is fully funded. Its going to happen. It will be Mac OS X initially and then iOS. Please contact me at peterdavey29@me.com if you are interested in learning more. Did anyone have In Control 4.0.3? Was there a bug with 3.5.5 that made the program flash a warning, saying that more than one user is using that program? I have been running the 4.0.3 version under System 9.0.4 using Sheepshaver to emulate a Power PC. Yes, it’s great, though the modal alarms have finally become intolerable to me. I did try to teach myself to program using Java. There were lots of libraries for hierarchical trees, and lots of libraries for tables, but no stable libraries for hierarchical tables like in InControl. You could kind of cobble a table into an outline, or vice versa, but it wasn’t really good. So there would have been a lot more from-the-ground-up work than I was ready for. Anyway, Sheepshaver has gotten worse (or more likely Mac has gotten worse at hosting it), and finally become intolerable to me, so I am trying to get my data OUT of InControl. Not so easy! Firstly, it won’t export to text unless the Claris XTND system is installed. Which it IS! But it won’t recognize it in my configuration. So I’m in a lot of trouble. I have dozens of thousands of records in it. Export to CVS, request a beta invite and migrate your data to SheetPlanner! Previous Previous post: Google Reader – it rocks!